Throughout the duration of your ownership of the HP Color Laserjet CP1215 you will inevitably make some changes to the way that the printer operates. There may not be a lot of changes, and they might be so minor that you forget you ever performed them. But the accumulation of these small changes will lead to an adjustment in the way that the printer operates apart from the default settings. 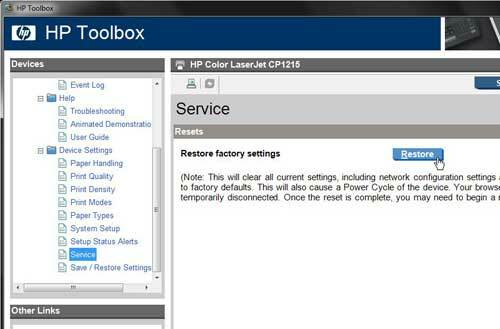 If all of your customizations begin to provide you with a negative experience, you might consider learning how to restore the default settings on the HP Color Laserjet CP1215. This will take the printer back to its’ original state, allowing you to make new changes from the settings that existed when the printer was new. This is an ideal solution if your printer is operating strangely, or if you are following a troubleshooting guide and are not able to resolve your issue, or are receiving unexpected results. 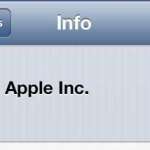 However, if there is actually a physical problem with your printer that is not caused by your settings, then restoring the defaults may not solve your issue. 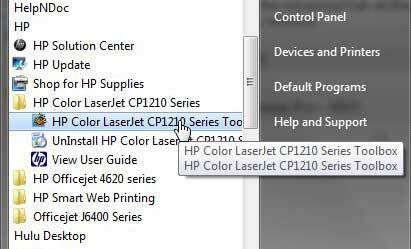 But if you are certain that any problems you are having are related to your settings, or if you simply want to learn how to restore the default settings on the HP Color Laserjet CP1215, you can follow the steps in the guide below. Step 1: Click the Start button at the bottom-left corner of the screen, then click All Programs. Step 2: Scroll to the HP folder, then click it once to expand it. 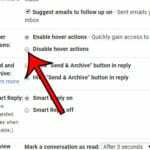 Step 4: Click the Device Settings folder to expand it, click the Service link under Device Settings, then click the Restore button at the center of the window. Note that this is going to to clear all of the settings from your printer, including any settings that you applied if this is a network printer. Additionally, take note of the rest of the warnings on the screen, as there will be some unexpected actions that occur while the printer is being reset. 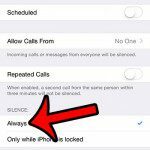 Why Is My iPhone Ringing in Do Not Disturb?